This family vacation planning post has been brought to you by The Motherhood and MiniTime…. Search online, ask Facebook friends for suggestions, tweet for recommendations… does this sound familiar when you are planning your vacation or a trip? Then after you’ve made a decision on where you are going, you research for reviews on places to stay, where the reviews may or may not take into consideration on whether you have kids and the ages of your children. Next, you go to the hotel/condo/resort site to book it. Then you look for activities and events that may be going on near where you will be staying and look for kid-friendly restaurants in the area. Who has time for all that? Not me. I recently heard about this great site called MiniTime that allows you to plan kid-friendly vacations. 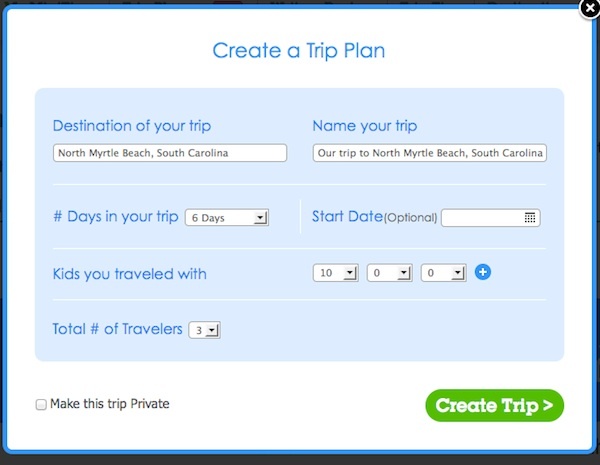 Planning a trip is just unnecessarily difficult but MiniTime takes the hassle out of trip planning. Especially for families. It would be nice to plan a vacation that you know wll be a perfect fit for your family. You can with MiniTime. You don’t have to wade through reviews after reviews trying to find if a place is good for families… you can actually get recommendations from parents just like you, with kids the same age as yours. And you can even book your hotel right there on the MiniTime site. A one-shop stop. I love that I can find destinations solely based on my son’s age. He is 10-years-old so I know that I can find accommodations and activities, etc., that will be appropriate for a 10-year-old. You do not need to sign up to MiniTime to search for reviews, etc., but you can get much more out of MiniTime if you do. I signed up using my email, but you can sign up using Facebook. And even share your trips with your friends on Facebook. I have been checking the site out over the last few days and I’ve found it to be user-friendly. Easy to navigate. MiniTime’s algorithm sorts results by age and destination. This means I can find destinations, activities, etc., that will be appropriate for my son’s age. I can read reviews from other parents just like me, with kids in my son’s age range. I know I would much rather have reviews and opinions from a community of like-minded parents. 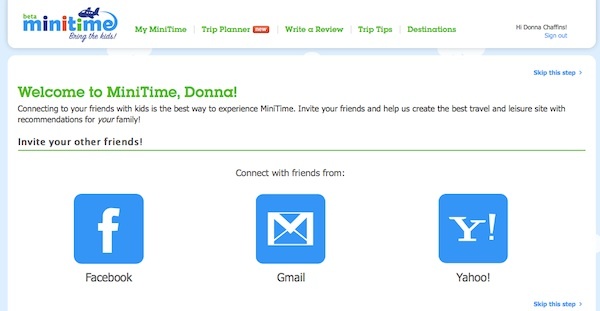 MiniTime is a relatively new site, but the more travel planners use it, the more expanded the site will get. Currently there are over 1,000 hand-picked destinations, accommodations, and attractions on the site… but I was able to participate in a webinar recently with CEO John Smelzer, of MiniTime, and he says that they are working hard to ensure that they include all locations. 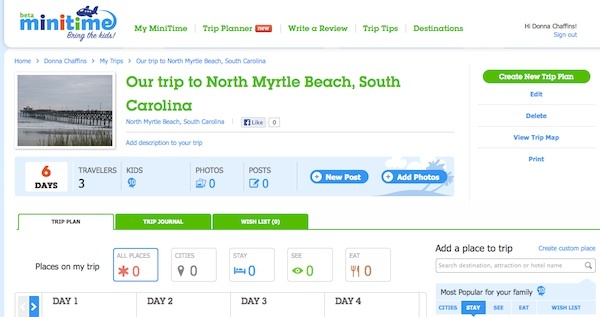 We will be going on vacation in a couple of weeks (I already booked our condo before hearing about MiniTime) to North Myrtle Beach and I am planning sites to see, and activities to do on MiniTime right now. We will be staying at Ocean Creek Resorts, this will be the fourth time staying there, so I can already give a review, however, I’m waiting till I get back, so I can give a more accurate review regarding staying there with a 10 year old. Since Ocean Creek wasn’t reviewed yet on MiniTime, I put it on my Wish List… I’ll add my rating for the resort and a review, so when other parents are planning a trip to N. Myrtle, they can see if Ocean Creek Resorts would be right for them. Although I am trying to count calories and watch what I eat, I pretty much throw that out the window while on vacation. So I’m excited to try some new restaurants that I found with good reviews and kid-friendly. In our home it really is more 50-50. We do consult at least nine online resources before finally deciding on our destination, accommodations, etc. I would say we spend a considerable amount of time on planning a vacation, too. I would love a one stop site, where I can find all the info I need on making our vacation plans and be able to book our hotel/condo stay. I’m definitely in the 88% of parents who trust recommendations from other parents will children the same age as mine. I also like sites that offer comparative pricing of online travel agents. What makes MiniTime different from other travel sites? MiniTime is the only site 100% dedicated to family travel, with recommendations based on the ages of your kids. I am really liking what MiniTime has to offer me when it comes to trip planning and I’m looking forward to adding my own reviews along with photos and tips of our trip in a couple of weeks. MiniTime is perfect for me, since I’m a ‘planner’. Besides, traveling with kids isn’t always an easy task and having a site like MiniTime will make vacation planning so much easier. I think you will find MiniTime to be helpful to you, too. Prizes: We will be giving away five awesome prizes to random participants who answer the trivia questions correctly. Four winners will receive a $75 VISA gift card and a MiniTime hoodie. And one grand prize winner will receive a $100 VISA gift card and a MiniTime hoodie. Where are you and your family going on vacation this summer? Disclosure: This is a partnered post with The Motherhood and MiniTime. All opinions are 100% my own and may differ from yours. I will only endorse companies, products and services that I believe, based on my own experiences, are worthy of endorsement. This looks like a great way to plan our family vacations! I will definitely check it out! Sounds neat. So nice to have it cater to families. This is a great way to ensure everyone in the family is having a great time while on vacation! I really need to check this out. I’ve spent many hours on Google looking this stuff up myself. I would have saved a ton of time for us over the past several years! This sounds like a great resource and something that a habitual organizer like me would fall in love with! I’ll certainly be paying the site a visit toward the end of summer. We’re going on a family vacation next week, so I’ll definitely check this out! I am all for anything that saves me time vacation planning. Sounds like a very useful resource! What a great resource for parents! I love that it looks for things that are just right for your kids age. How great is that!? That looks like a great organizational tool! It’s a pretty great concept to have a site where you can filter by ages, that way you can have a better idea of appropriate activities for the whole family! This is so awesome! What a great idea. I’ll remember this for our next vacation! Love this. I need to check out this site for my kids trip to floridA. 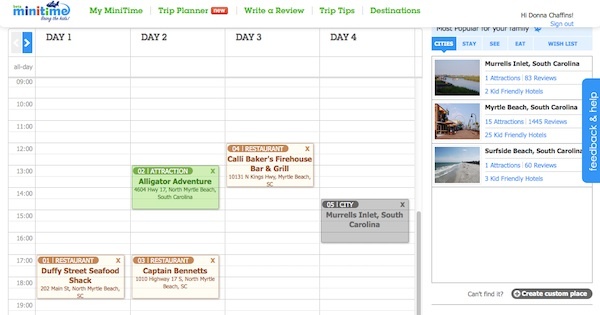 Looks like a great way for families to easily coordinate their family vacations! I am actually going to check this out right this second. 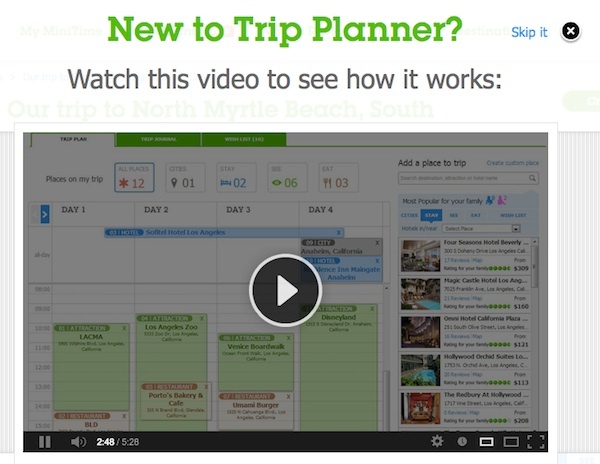 I love anything that helps me with travel planning.